Education in Video provides the first-ever online video series developed specifically for training and developing teachers. This multi-volume collection gives students a reliable way to observe the intricacies of behavior that define effective teaching styles. Video content includes demonstrations, lectures, documentaries, and primary-source footage of students and teachers in actual classrooms. The collection also contains ready-to-use teaching tools, including course, study, and discussion guides, assessment checklists, and themed playlists. The series features hundreds of experienced professionals in a wide variety of settings. In-depth and special-topic videos enable both new and experienced teachers to expand their knowledge and link abstract theories to real-world situations. The collection is global in scope. Education in Video: Volume II features 100+ Association for Supervision and Curriculum Development (ASCD) videos that provide expertise from authorities all over the world and expands its resources in educational leadership and training. ASCD videos demonstrate research-based teaching techniques, offer instruction and strategy, and provide expert advice to further innovation in your educational programs and improve learning. 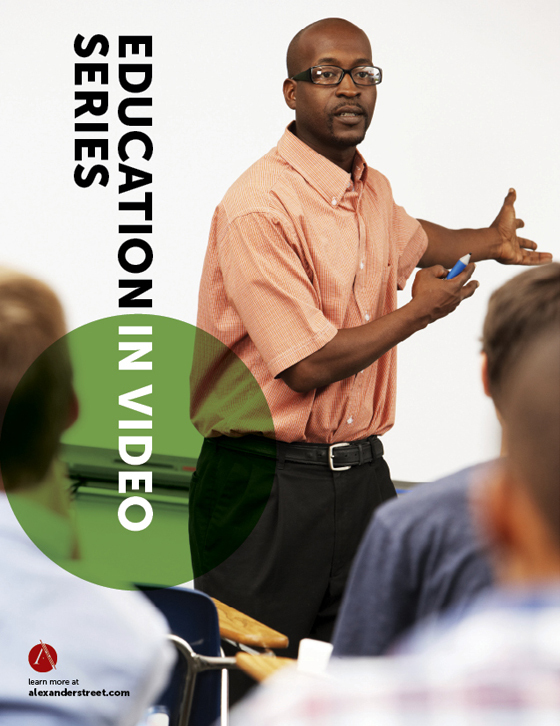 This Volume includes video covering contemporary subjects and emerging teaching approaches. Content expands upon topics covered in Volume I, and places an emphasis on special needs, English as a second language, and the US Common Core standards. Users must be authenticated to see content linked to from this guide. This link searches volumes I and II.